But the club wasn’t pleased that James Paxton and Jean Segura weren’t named to the team. Both are still possibilities to make the AL team. On Sunday evening, the complete rosters for the 89th Major League Baseball All-Star Game, which is being held at Nationals Park in Washington D.C., were announced on ESPN. The Mariners had three players — closer Edwin Diaz, outfielder Mitch Haniger and designated hitter Nelson Cruz — chosen as reserves for the American League squad. 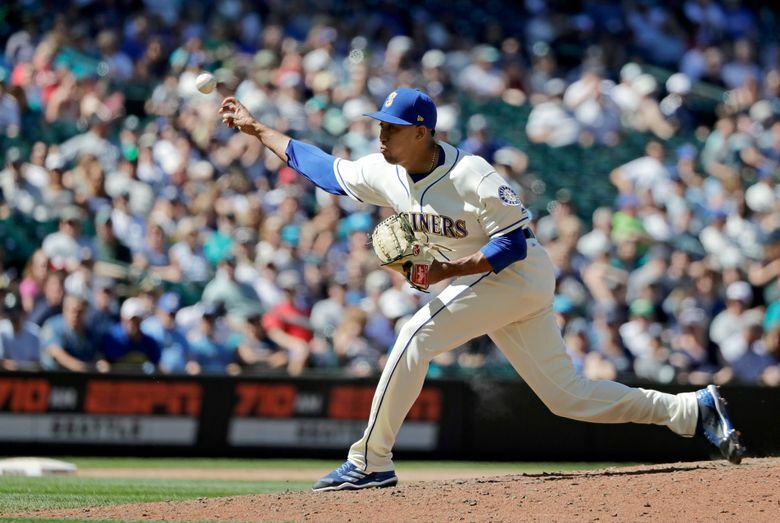 Three All-Star selections are a good showing for any team, including the Mariners, who improved to 57-34 on Sunday with a 6-4 win over the Rockies. This was just the third time since 2004 that the Mariners had at least three players chosen for the All-Star Game. For Haniger and Diaz, this is their first selection. Cruz will be going for the sixth time. Yet the Mariners felt they deserved at least two more selections: shortstop Jean Segura and pitcher James Paxton. It was something those chosen seconded. There’s a chance that one or both players earn a trip to D.C. Paxton could join the pitching staff if a pitcher isn’t available to throw. Segura is the first Mariner to be selected as one of five American League Final Vote candidates for the 32nd and final roster spot on the AL team. He joins outfielder Andrew Benintendi of the Red Sox, shortstop Andrelton Simmons of the Angels, outfielder Eddie Rosario of the Twins and outfielder Giancarlo Stanton of the Yankees on the ballot. Voting is available online at Mariners.com/vote and MLB.com/vote. Fans can cast their votes up until 1 p.m. Wednesday. Segura, who is hitting .330 with an .827 on-base plus slugging percentage, seven homers and 47 RBI, wasn’t quite as diplomatic. He knows his numbers which also include: 37 multi-hit games, 15 three-hit games (the most in MLB), 115 hits, which is second only to Jose Altuve in all of baseball. Segura has enough pride to not campaign for the final vote. Cruz didn’t seem concerned about Segura’s lack of campaigning. “Well, we’re all ready to start doing it for him,” he said. Servais lobbied fans after the game. Diaz, who notched his 35th save on Sunday, wouldn’t allow himself to think he was a lock to make the All-Star team, even though he was by every measure of his performance. Diaz, 24, leads all of baseball in saves and ranks second among all relievers in strikeouts with 78, behind Josh Hader of the Brewers (83). Diaz is 35 for 38 in save opportunities with a 2.30 ERA (12 ER, 47.0 IP) with 78 strikeouts and 13 walks in 47 appearances. He is averaging 14.94 strikeouts per-nine innings, while limiting opposing batters to a .155 average. Of his 35 saves, 20 have come in one-run games — the most in MLB this season. He’s three away from the Francisco Rodriguez’s record of 38 saves before the All-Star break set in 2003. Haniger, 27, is hitting .271 with a .847 OPS, 16 doubles, two triples, 17 home runs, 62 RBI in 88 games. His 62 RBI are second most in the AL. And he leads all of MLB with 13 game-winning RBI and 11 homers in the seventh inning or later. With the suspension of Robinson Cano, Haniger has filled the No. 3 spot in the order and helped pick up some of the lost production. Cruz, 38, is hitting .267 with a .909 OPS, 10 doubles, a triple, 22 home runs, 53 RBI in 76 games. He’s made the All-Star Game five times in the last six seasons (2013-15, 2017 and 2018). As in past seasons, Cruz said he will not participate in the Home Run Derby.